With another name of intracranial tumor, brain cancer actually includes the primary tumor originates from brain parenchyma and secondary brain cancer, the metastases from other parts of body. Its symptoms vary as individual condition changes. Specialist from Modern Cancer Hospital Guangzhou would explain the causes and common symptoms of brain cancer. 1. The radiation and electric waves from mobile phone and computer can promote the canceration of cells. 2. The occurrence of brain cancer is related to the contact of insecticide, solvent, dyes and formaldehyde according to studies. Additionally, a pregnant woman takes alcohol or hair dye before delivery would increase the risk for babies to develop neuroblastoma. 3.A tumor may develop in brain just because of environmental trauma irritating brain and scar tissues of brain. 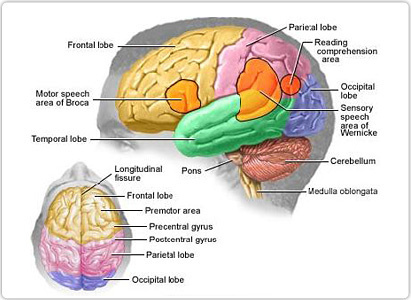 This traumatic tumor mostly occurs on a base of damages in cerebral dura mater and arachnoid. External injure of brain can stimulate the growth speed of existing brain cancer besides. 4. Radiation. The long-term exposure to radiation is another cause of brain cancer. What Are the Common Symptoms of Brain Cancer? 1. Headache is one of the most obvious symptoms of brain cancer. It normally occurs in 4 or 5 am when the patients are in deep sleep. Patients often wake up due to headache, with sleep deeper, headache more server.. The headache disappears gradually at 8 or 9 o’clock after getting up. 2.Spraying vomiting. Compared to vomits that are caused by gastric diseases, the vomit occurs on brain cancer normally shows no symptoms like stomach stuffiness and distension, nausea and abdominal pain or diarrhea. Moreover, the vomit is not related to foodintake, it is just a sudden spraying vomit soon after headache, which is because of increased intracranial pressure stimulating the vomiting centre of medulla. Besides, abrupt twitch, single exophthalmos, deafness in one ear, hemiplegia, lowered eye vision, diplopia, difficulty in swallow and sustaining body balance, dizziness, are also the symptoms of brain cancer. Specialist from Modern Cancer Hospital Guangzhou reminded that, brain cancer symptoms vary as per different individual condition, once any suspected symptoms occur, the patient should have related examinations and treatments in regular hospital in time.